Themes: Hi-Lo, graphic novel, adapted classic, low level classic. This series features classic Shakespeare retold with graphic color illustrations. Educators using the Dale-Chall vocabulary system adapted each title. Each 64-page, softcover book retains key phrases and quotations from the original play. Research shows that the more students read, the better their vocabulary, their ability to read, and their knowledge of the world. A beautiful love story turns to tragedy when jealousy takes root. 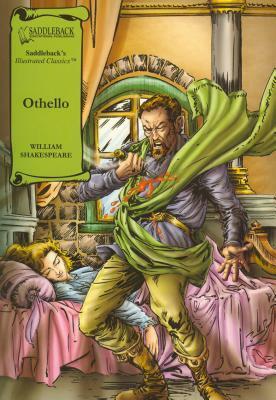 The powerful general, Othello, finds himself hurting the one person he loves most in the world, his wife, Desdemona, when he misplaces his trust in Iago. Treacherous and vindictive, Iago is enraged at being passed over for a promotion and plots his revenge against Othello setting off a chain of events that ends in the ultimate sacrifice.